The life of this plant is poetical. During the summer months a luxuriant growth of leaves is produced. As cold weather approaches these lie down upon the ground and are soon covered by the falling leaves which have been nipped from the trees by bite of the frost king. Soon, too, they are covered with snow. In this warm cradle they sleep through the winter, yet, as it were, with open eyes for the dawn of spring. Had the Hepatica the power of reason, we would say that it longed for spring, for after the first few warm days that herald the approach of that season there is activity in every part of the plant. It does not wait to produce new leaves, but in an incredibly short time sends up its flower stalk and spreads its blue, purple, or white petals to the warm rays of the sun. 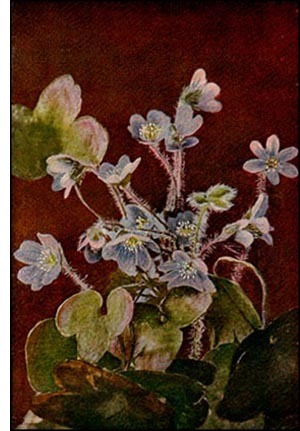 The hepatica is truly a harbinger of spring, and in eastern North America, from southern British America to the Gulf of Mexico, its appearance introduces the new season.